We're happy to answer questions or get you a quote. Please fill out the form below if you need assistance. We will get back to you as soon as possible. All orders placed over the weekend or holidays will be Shipped ASAP via UPS in the order received. Shipping Estimates are available in the Shopping Cart. Questions about Shipping or Returns? Click here. 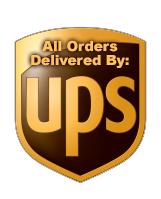 We use UPS for shipping, they do not deliver to PO Boxes, we do not set the rates. We are open 9 - 5 EST Monday - Friday. We closed on Saturday & Sunday.